Instead I’ll give you the teaser that there will be many cool nature, beach and sunset images coming, as soon as we solve the technology problem. I hope everyone has a beautiful Memorial Day. Jack has his first golf lesson. Maybe next time he’ll remember his formal wear. 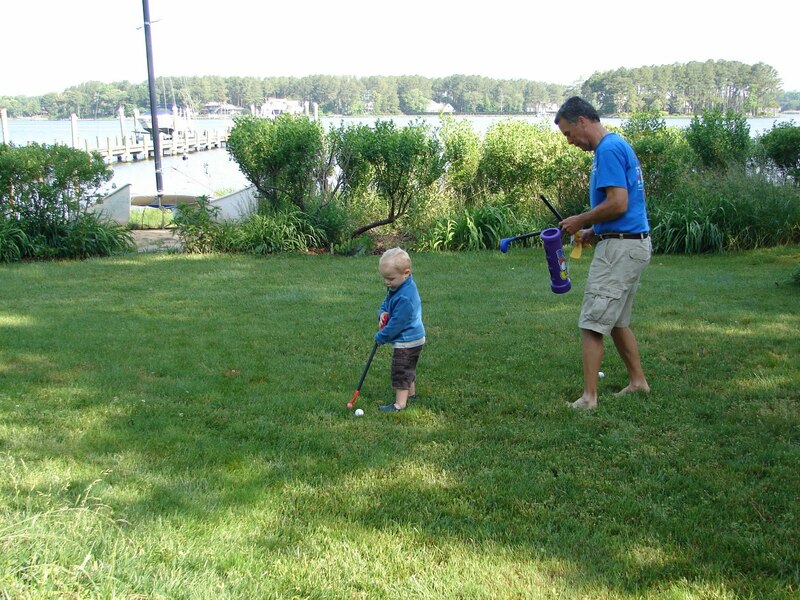 After the lesson, PaPa and Jack went to play a few holes in the yard. But look who got stuck doing the caddying! 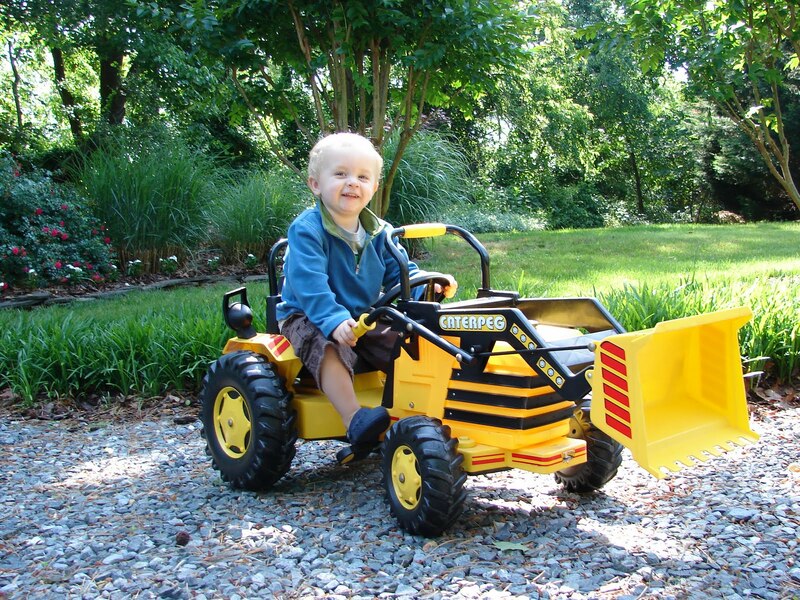 Later Jack was reunited with his beloved backhoe. What a great find that was! 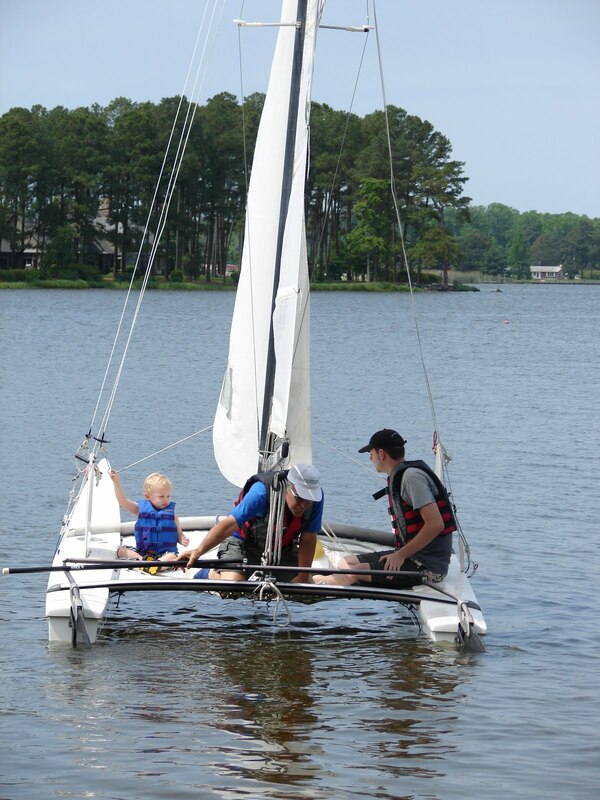 The biggest news of the day is Jack went on his first sailboat ride. He was adamant about getting on the boat when it was beached on shore and when PaPa and Daddy came back from their long morning ride Jack wanted a turn. I figured, we have a life vest for him, what’s the worst that can happen? He went once across the river and back and then asked to go again. He was gone for about 30 minutes and all reports suggest that he was a great listener moving from one side to the other when asked, staying seated and ducked under the boom when tacking. We might have a little sailor on our hands. I will, however, refrain for getting him a sailor suit. Here’s a our sweet moment of silence on our car ride. I’d love to say it was a piece of cake and they both behaved beautifully but that is not the case. So instead I offer you pictures of my sweet boys followed by my tragic tale. We’ve been dealing with our fair share of sh*t lately. 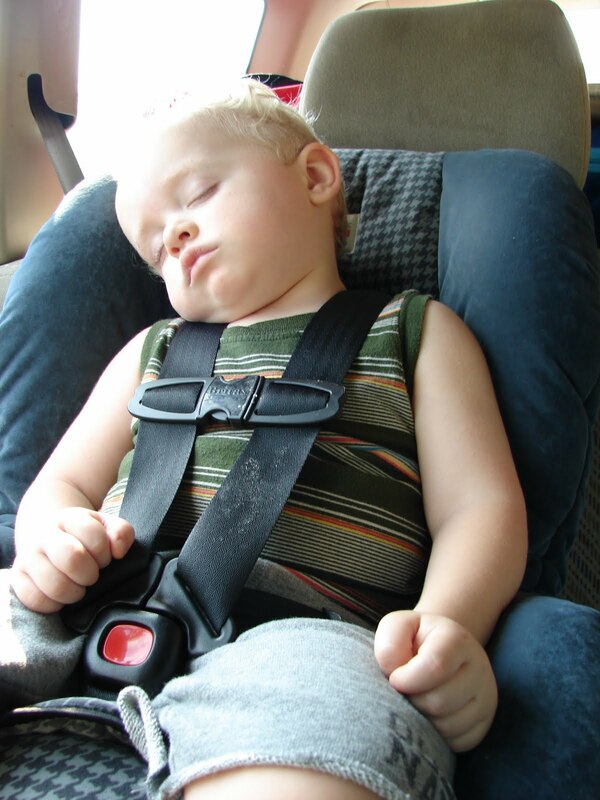 First there was the hormonal sh*t. Then there was the epic sh*t. And then there was the tragic car ride. Things started out great. They were content and then they were both asleep and the husband and I couldn’t help but comment on our good luck. Biggest. Mistake. Ever. Henry started to fuss and we needed gas so we stopped. Decided to do a diaper change to be on the safe side. It was another billion-wipes used, coming out everywhere change and of course we stop at a gas station in the middle of nowhere. So of course it’s basically a food cart (like on a street corner in Manhattan) with gas pumps so I didn’t even bother looking for the bathroom. So this whole messy diaper change was done, where? on MY car seat. My husband turns to me and says sarcastically “What so you want me to do with this onesie? Throw it away?” I thought for about 10 seconds, and said, in all seriousness, “Yes! That’s a great idea!” The car was filled with stuff we packed, this gas station was a joke- where was I going to wash and dry this shirt. So we did the unthinkable, we threw away the onesie. If this is the most challenging part of our vacation then I call it a win. 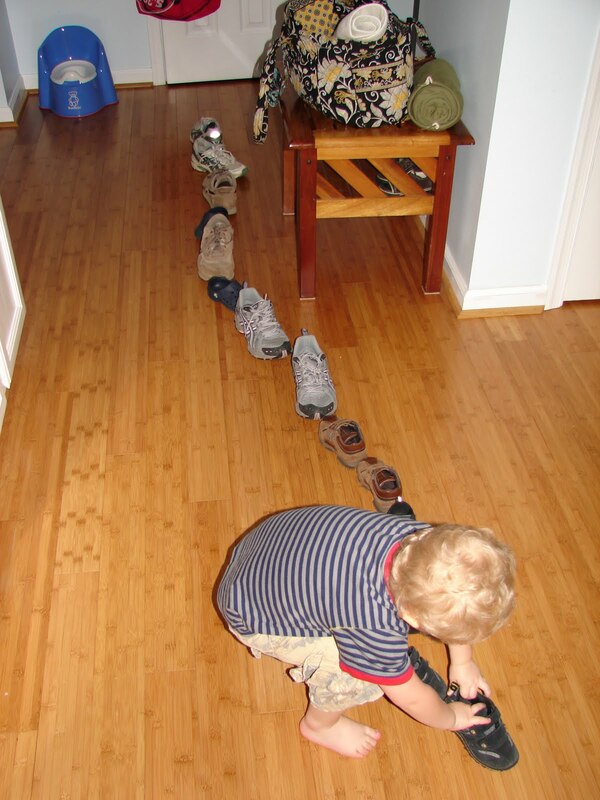 My toddler makes choo-choo-trains out of everything. Everything. It’s very cute, but often leads to a whole lot of Mommy cleaning up after these little creative endeavors. 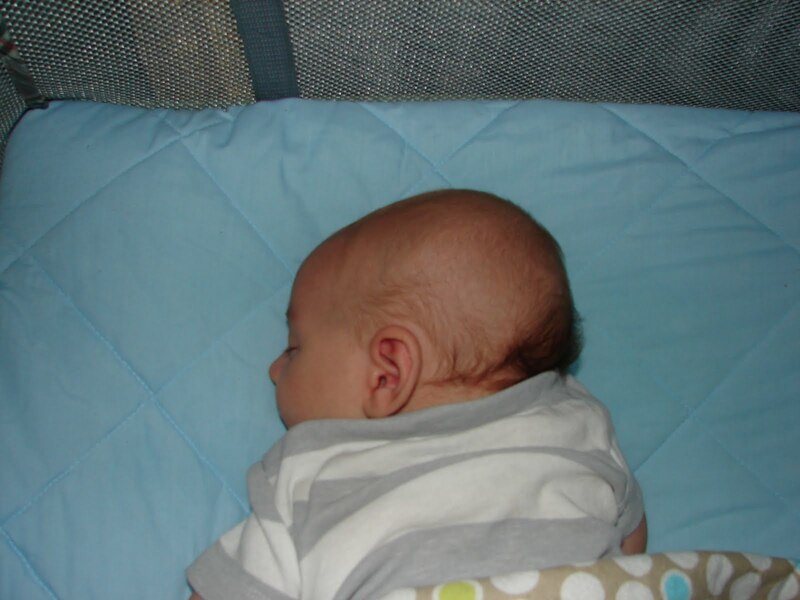 My poor sweet baby suffers from the strangest looking androgenic alopecia male pattern baldness. In cuter news he grabbed my finger, purposefully, and put it in his mouth today. It took him about 5 minutes. He had the cutest, determined look on his face while he was trying it. And just to practice his new skill he did it a few more times before before bed last night. We went on a walk last night. 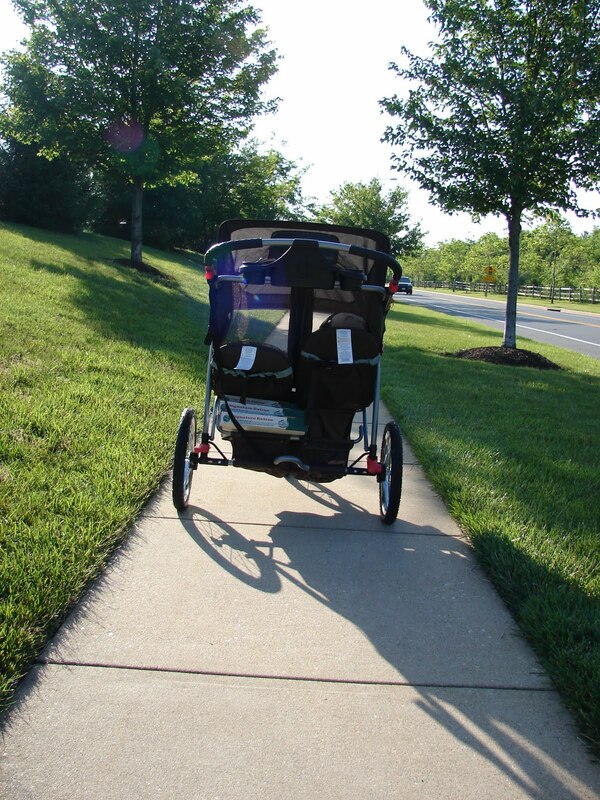 Exercise, be healthy and all that… so what’s that under the stroller you ask? Um… nothing, just some Papa John’s pizza. My birthday (today) present this year is a new phone. Check it out! I know what you’re thinking… no Blackberry, no iPhone? Nope, not for me. My internet addiction is already totally out of control, the last thing I want to be is the mom at the park that doesn’t bother looking up from her crackberry. 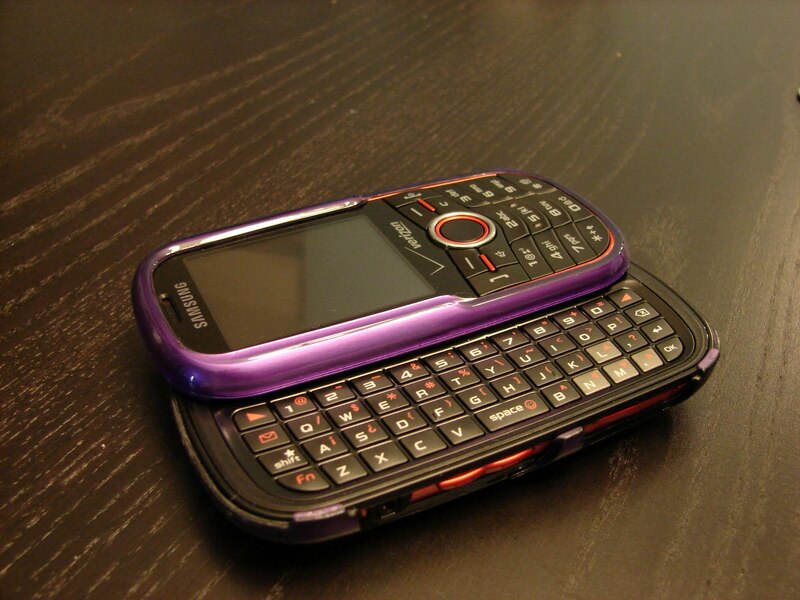 Besides this one is purple, and it slides so I can type, so now my texting speed is much improved. *Updated* Henry noticed the cat today. Which was very cute! He was just sitting on my lap and all of a sudden he got this look on his face like ‘what is that? !’ and he watched Monkey walk along the back of the couch. So exciting! Today we had our own little comedy of errors. I will preface this by saying Henry only poops once a day. Weird, I think, but not outside the realm of normal. So, as you can imagine, when he poops it’s…. epic. Well today he was a little fussy so I put him in the swing so I could clean up from breakfast. When I hear that sound. You mommies out there know ‘the sound’. So I go over and pick him up only to find that I can see it has leaked up the front of the diaper. This is never a good sign, my friends. It leaked up the front and out the legs. At this exact moment I think of this. It’s everywhere, swing needs to be washed, everything Henry is wearing might as well be burned. I’ve gone through about 8 baby wipes and he starts to pee. At this point I carry him into the kitchen and put him in the sink. Now that he’s all squeaky clean I wrap him in a dish towel and bring him back to the changing table on the pack n play. As I’m carrying him across the room he throws up. All I could do was laugh. I mean, really, it doesn’t ever happen all at once like that! So Henry is here, naked under this blanket because I’m running upstairs to get him some clothes… while I’m at it I might as well do a load of laundry because I’d rather eat irresponsibly raised pork than clean everything he just soiled by hand! Jack remained blissfully ignorant. Lucky him! I know I said I washed him in the sink…. but just to be absolutely sure. Also, lets not have a repeat tomorrow. Yes, it was very funny, but tomorrow is Mommy’s birthday and that would be not so nice. Thanks. Today I went back to my first post-baby yoga class. It felt good! So… so… good. I kept up just fine but I noticed some interesting things. See, with yoga, I’ve become more attune to my body. The two poses that I felt the best in/ was the most aligned in were the two poses that I felt the best in for my entire pregnancy (and both I did during that class where I went into labor). Half moon pose and pigeon pose were my happy poses of the day. The body is a strange thing. Before I always thought things like ‘muscle memory’ was really my brain’s memory of how to control my muscles to perform some specific task, but this was totally different. My body remembered that there was more stress and pressure on the right side and despite my best efforts, behaved accordingly. Clearly more yoga is required. What’s a girl to do? So I gave Jack this backpack to play with. He likes putting toys in it and carting these items around. Well yesterday he pulled this little stunt. Matt looked at me with a sad face and tears in his eyes… not ready for his little boy to grow up and I was pumping my fist in the air. Am I a bad parent or is this merely a reflection of the fact that I’m the one that stays at home with the kids all day? Either way, it was pretty cute. On the day that I went into labor with Henry I *thought* I *might* be in labor so I went down to the midwives for a labor check. They thought I wasn’t in labor, hah! I sure showed them! Anyway, that was a long morning so on the way back home I stopped at Einstein Bagels for a tasty turkey sandwich ::drool::. Well, the drive thru was closed and so I went inside and waited 5 minutes at the counter for someone to acknowledge I was there. Then I waited for a few minutes while the cashier talked at basically the volume of a jet engine to some other guy so that I could, you know, pay. Then he forgot to give me my cup so I couldn’t get a drink-nor get a word in edgewise- while I waited, and waited and waited for my food, which when it came was not what I ordered. Then I got in my car, twitching, and drove home so I could call corporate because, seriously, that’s not what I call service. I basically left a message with corporate just explaining the deal and I figured since the guy who refused to ring me up was the one wearing the little Manager badge the district guy might at least read him the riot act for getting a complaint. So today in the mail I get a letter from corporate with vouchers for 2 free sandwiches and a free bakers dozen bagels. Um, awesome! You have not lost a customer, Einstein… well played. I will however be going to the other location near me next time. At my 6 week check up my midwives discussed birth control and I would LOVE to use the Mirena because something a. I don’t have to think about and b. can make my periods shorter and lighter sounds like a pretty sweet deal. Unfortunately I’ve never done well with hormone birth control. I’ve tried: ortho tri-cycline, ortho cycline, ortho evra, and the nuva ring. Each one has made me crazy (it’s not uncommon for some women to experience severe enough emotional effects from birth control that it doesn’t make sense for them to use that type of method). And when I say ‘crazy’ I mean crazy-von-crazy of crazytown. Knowing this my midwives suggested the mini-pill as a way to test my sensitivity to progesterone (because everything but mini-pill and the Mirena includes estrogen and progesterone). Sadly I took another trip to crazytown and now will have to resort exclusively to hormone-free methods, because seriously what partner is willing to have ‘relations’ with a person who hates him, everyone else and is willing to demonstrate this by cursing like a sailor every chance she gets? I’m starting to wonder if the pharmacy is mixing up my order for birth control with someone else’s order for crazy-pills…. Hmmmm….. This pill-poppin’ problem does explain why I seem to be missing all the basic coping skills a parent of two should have and why until this point having two has been stressful, yes but not unmanageable. It has also seemed that Henry has been quite a… um… pill lately and behold through the power of Google I have discovered that some women who used the mini-pill noticed a serious increase in fussiness because their milk flavor/supply/whatever changed enough to make the baby cranky. 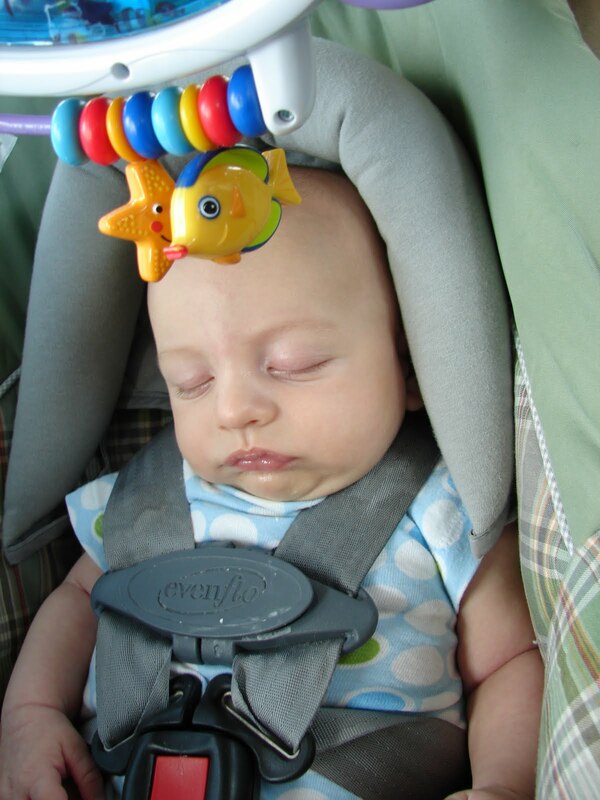 Fortunately most report that within 2 weeks of stopping the pill the baby returned to their non-fussy self.